The Fort Meade Alliance is a leader in educational development and addressing the skills gaps and workforce needs for regional employers. 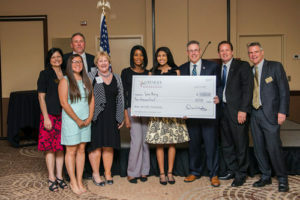 The Fort Meade Alliance Foundation awarded its sixth Kenneth McCreedy Scholarship to Sara Herry of Meade High School at the June 2017 FMA Annual Meeting. The Kenneth O. McCreedy Scholarship, the first initiative of the FMA Foundation, was developed to assist Meade High School students who plan to pursue higher education in the fields of science, technology, engineering and math (STEM) or linguistics. The scholarship recognizes outstanding, well-rounded graduating seniors for their past achievements and aids them in accomplishing their career goals.The Fort Meade Alliance is a leader in educational development and addressing the skills gaps and workforce needs or regional employers. Students must be planning to enter a STEM or linguistics field of study supportive of national defense or homeland security (i.e. engineering telecommunications, computer science, mathematics, language, or other related technical electives). Recipients must also be the child of military personnel or Department of Defense civilian employees. Each scholarship is for a total award of up to $4,000 for a four-year college program or up to $2,000 for a two-year college program. 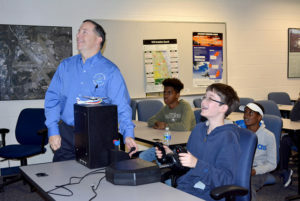 The Fort Meade Alliance has created Tech Mania and STEM Family Night to bolster students’ interest in science, technology, engineering and math. The FMA Foundation provides the funding that makes these programs possible! Read more about the FMA Student Programs by following clicking here.